Whether you have made the decision to homeschool or are still considering the final decision to actually homeschool or home educate your children, one of the most major decisions is which curriculum will be used. The choices can be a bit overwhelming and I have highlighted what I have used over the years. Here are my selections for Grade 2 and Grade 4. The past couple of weeks I have been scouring over curriculum, reading reviews, asking my homeschool community their thoughts and opinions and with a local home school expo weeks away, I’ve decided I need to buckle down and get busy deciding what will work for us and what will not for the coming school year. I recently wrote about our summer school curriculum and touched base with what we were finishing up with from last school year. Looking at oursecond grade curriculum I am happy with what I have chosen thus far. We will still attend homeschool co-ops for enrichment classes such as Art, Gym, Music & Foreign Language. My daughter will also continue her gymnastics lessons and weekly ballet class as well as begin violin and piano lessons. We will not be continuing with horse riding, we may pick this up later, but for now, we will cease this enrichment. My son will begin piano and guitar lessons and we need to find another enrichment class for him. He does not like sports and seems to lose interest in each sport class we have tried pretty much at the beginning of each session. (we have tried gymnastics, basketball, golf and fencing). In the past I used Horizons Math for my son and my daughter and while it sort of worked, it was just busy work. My daughter does not do well with busy work. Sheet after sheet after sheet makes her go crazy and cry. Rod & Staff presents, explains and executes their materials in a fun way using animals ( a big plus with my daughter). I am particularly fond of the teacher's manual). My son is quick witted and learns at a very fast pace. I need to keep him interested and Horizons simply did not do that. This will be the first year my son will be using Rod & Staff. He attended a private school up until the spring and this will be his first year homeschooling full time (I always supplemented his education). I have used many curriculum with my son for Math, really anything to keep his attention and challenge him. He was in accelerated math at his old school, thus the reason for using a Grade 5 curriculum for him this year (he is only in 4th grade, technically). My daughter really loves Growing With Grammar. A very simple, repetitious program that is cost effective. It’s a workbook model, with daily exercises slowly teaching new concepts. My daughter can whip through her assignments rather quickly and I love that. Very straightforward. We are finishing up this book over the summer and will move on to the next level in the fall. My son will be using Writer's Inc. and Shurley Grammar Level 4 this year. Shurley Grammar is too easy for him as we have been reviewing it over the summer. My son needed to catch up to his homeschool co-op peers - so said the director, but I see that he needs to be at the next level, hopefully once CC starts, she will agree with me. Last year when we pulled our daughter out of private school I was in a time crunch for curriculum. I purchased an Evan Moor Spelling book and have been using this for her. While it "worked", it didn't really work. My daughter did not progress in spelling at all. I don't know if that is the curriculums fault or simply the teacher (that would be me). I purchased Spelling Workout after much thought and hope this will work. My son, on the other hand is a whiz at spelling. I purchased the Level D book for him and am realizing that this book is simply too easy for him. I should have purchased the next level. Unfortunately, I could not see this book before I purchased it. I might just jump to Level E for him anyway. My daughter has wonderful fine motor skills, but her handwriting is horrible, I think because she is left handed and struggles with where to place her paper and how to hold her pencil. While I think the Penmanship book from Rod & Staff was fabulous, she hated it. So much so that I stopped using it for her. I will save these for my little one since she loves to sit and copy script. I have not found anything for this school year and will be on the lookout at the homeschool expo. My son will be taking Composition at his co-op combined with Literature. His assignments are reading and writing reports on the books he is assigned. I have ordered all the material assigned and after perusing the books have discovered once again, these books are well below his reading level. I am not sure what to do since I had originally asked that my son be moved up to grade 5. The director did not agree with me stating that her program is quite rigorous. We may be addressing this issue after a month or so once CC begins. LOVE, love, love this curriculum. I used this for my daughter and I was under strict orders from my son to never teach History unless he was present. The reading book was wonderful and east to understand (I read the stories to my kids). The activity book was equally as awesome. I was able to complete almost all the activities they would assign per chapter. We made some amazing projects! This past school year my daughter also used Evan Moor Geography. In Daily Geography Practice, Grade 1, 36 map lessons introduce basic geography skills and over 60 geography terms. What a perfect hands-on approach to geography instruction. But it was boring after 36 weeks of maps.But my daughter is a whiz at maps now! In addition to The Story of the World material, my son will be taking Omnibus at CC. The books he will be using are Mystery of History: Vol II, Bible Atlas, and Leagues and Legends. Will I use it again? ? I actually really like the Rod & Staff curriculum. Thus my reason to use English this year for my daughter. Last year I never used English as a subject, instead I utilized Language, Grammar and Reading materials. I used Evan Moor materials for Language and Reading. I will not be using the Reading book any longer, but will most likely pick up the Evan Moor Language book for Grade 2 later on in the school year. I like this for supplement. I will also pick up the Grade 5 for my son. 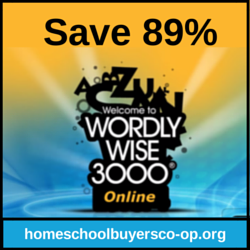 I will also be using Wordly Wise 3000 for the first time this year and am excited for this material as well. The book basically will teach my daughter 150 new words this school year. If my son is not too boggled down with school books and work and needs something extra, I will get Wordly Wise at his level as well later on. Last year my daughter had Science at co-op using RSO Earth Science , but I also supplemented at home using Evan Moor Science. Evan Moor helps students develop a genuine understanding of standards-based scientific concepts and vocabulary using the 150 engaging activities in Daily Science! A variety of rich resources, including vocabulary practice, hands-on science activities, and comprehension tests in multiple choice format, help you successfully introduce students to earth, life, and physical science concepts. I liked this book and so did my daughter. My daughter will continue at co-op with RSO Earth Science and we will be using the Patterns of Nature this year. Patterns of Nature consists of 30 lessons bound in an illustrated workbook. Science, at this level, mainly involves identification. Such subjects as seasons, seeds, wildflowers, weeds, trees, mammals, insects, songbirds, and the celestial bodies are introduced on the child's level. My son will need another supplement in Science as well. He is really interested in Physics and Chemistry. I have yet to find any Physics material related to his age. I am going to be looking at the homeschool expo for material for him. My son really loves Science (all aspects) and I want to foster that love for him. We used Bible Stories to Read last year, which was simple and straight forward. The stories were from the Old Testament and gave simple questions at the end of each lesson. I also used the bible verse for memory work. I also used Voyages books for my daughter (I had already purchased the books for her at private school and simply continued to use these). I do not think the publisher is making these books any longer because I simply can not find them. If I could, I would use them again. I need to find my daughter Religion and Memory books for Grade 2. If I like the God's Great Covenant, OT book for my son, I will go ahead and purchase Book 1 for my daughter. I simply utilized on line resources for Spanish and will continue to do so for this school year. My son had Spanish class during his regular class periods at the private school he attended. My daughter had Spanish class up until Jan when we pulled her from privates school. However, she did continue Spanish at co-op. My son will begin Latin this year and his curriculm will be Logos Latin Student Handbook I. He is very excited and has already starting reading this book. Our approach was quite simple, I gave her a journal and a topic each day and my daughter was to write a complete sentence to the prompt and draw a picture. She actually likes this so much that she began a personal daily journal that she continues to write in. Additionally, whenever we have an outing, the assigned task on the way home is to write about your day. Tell me what works for you and what doesn't - I'd love to hear! !